This tutorial is valid as of: . Written by Mu0n. Who made the x-wing vassal module? Someone named Aiden, who happened to post on afewmaneuvers back in 2012. Since then, the module has seen some work from Buhallin in early 2013 to add some needed features (ship moves with right click menu). The modules are now maintained by Mu0n since August/September of 2013 (wave 3, firing arc corrections, length corrections, imperial aces, wave 4, transport, corvette, etc. ), with help from theorist, chris B. for art, sigzog for helper ref cards, radarman5 for ship art, gabriel for map packs and silentubiquity for map packs + ship pictures + squad logfiles + side table logfile. A huge set of programmed features (that brought squad autospawn, overlapping backtracking, etc) appeared in early 2017 thanks to the tremendous help from ajmath, haslo, Guido Kessels, yours truly, and many others. This is cool! I want to support this. How? Thank you for your support. Any donation means a lot to me (Mu0n). I have bought ships to helping hands in the past, using a part of the donations. If you want to support this effort using patreon, which will charge a modest amount every time a major release hits, check out the details over at my patreon page. If you want to make a one-off donation, you can use my paypal donation link. Why are the pilot and upgrade cards empty? I logged in and it was empty. Where do I find players? I want to participate in tournaments. How do I find some and sign up? Whenever you log into the Vassal server, pay attention to the text that pops right at the top of the chat window. This will contain a few links about upcoming tournaments and the Vassal league. A big hotspot of active players can be found in the Vassal League Players Slack Channel. Where to get the X-Wing vassal module files? Which module files are the ones I need? That's it. Really. That's the only mandatory file. It contains a few 3x3 starfield maps (classic, light and deep), a teal nebula map (formerly known as blue nebula) and then a bunch of standard black maps (3x3, 4x4, 5x5, 3x6 and 6x3). It contains all ships, pilots, upgrades, tokens, dials currently released in its counterpart tabletop game, and then some, as previews from FFG filter out information to us. Vassal is a great way to try out some of the unreleased, but spoiled stuff from the game. The following map packs (and earlier versions) are no longer supported. Please don't use them anymore. Where are the module files supposed to go? Anywhere that's convenient to you. Vassal does NOT impose any special location on your computer. (optional) Map extension files: they end with a .vmdx file extension (as seen in the download page). They will be placed in a subfolder at the location of the main module file, (following the example) in \My Documents\Vassal\[--the module name followed by _ext--]\ when they are properly installed. 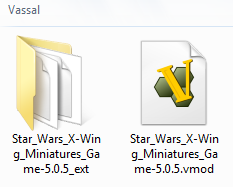 (optional) The subdirectory bears the name: "Star_Wars_X-Wing_Miniatures_Game-5.0.5_ext"
Now that I have the module files, how do I install them? And select your main X-Wing module file. Vassal will then launch it. (optional) If you want to install the map packs immediately, close those new windows and go back to the launcher. Add the map extensions by right clicking your module name in the launcher window and selecting "Add Extension..."
Do this for all map extensions. I already have the X-Wing module, but must update to a new version. How to do it? 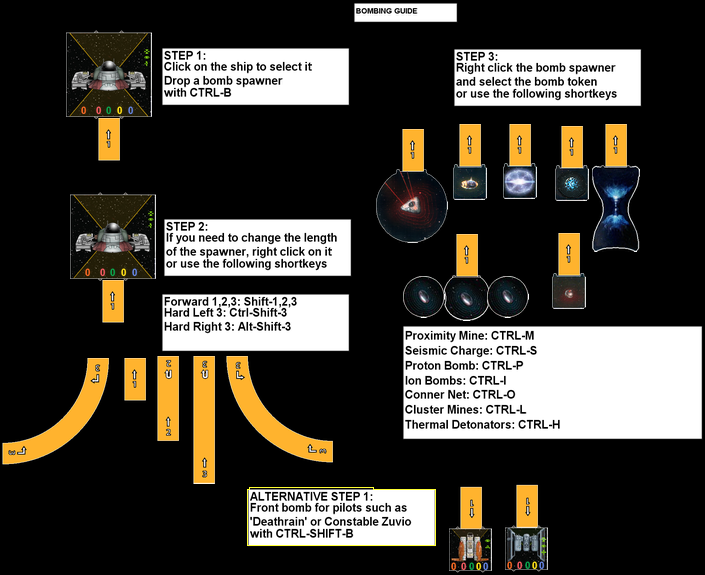 The third step is to download the new file (from the page whose link is under "How to install the x-wing vassal modules for the first time") in that same location. Vassal will then attempt to launch the module - close those new windows and go back to the launcher. The fifth step is to add the map extensions by right clicking your module name in the launcher window and selecting "Add Extension..."
How can I know when to update the module? Is it important to update? When you attempt to log onto the X-Wing Vassal server and if there's a new version available, a small popup will appear at the start of the logging process. 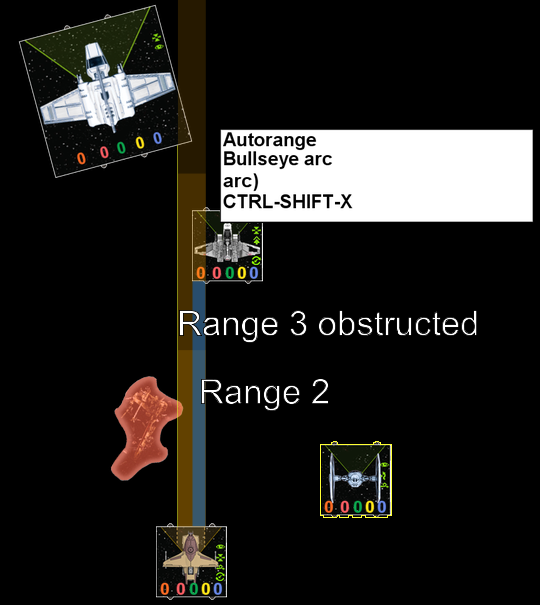 This popup will display the current version, the newer version and contain a link to the x-wing vassal module download page. Follow it and update! It's fairly important to update your module version ASAP. Sometimes, some game pieces or mechanism will behave strangely as bugs are fixed and features added. In order to manipulate X-Wing ships, tokens and do anything of substance, you need to be a numbered player inside a game room. When you first log into the X-Wing Vassal server, you're a generic user inside the 'Main Room'. How do I spawn a squad? Build a list with these squadrons. Be in a vassal game room, as a numbered player. 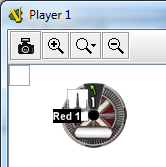 Open your numbered player window (button showing up as a yellow number on a black square). Click on the Squad Spawn button. Paste your squad's URL. Your squad will spawn inside your player's window. Alternatively, you can use the keyboard shortcuts to do this much faster. Important: you can always clone a ship by clicking on it (left mouse button), hitting Ctrl-C, then dragging the copy away from the original. This saves time when you have multiples of a ship type in a squad. Use '.' and ',' to cycle through the available moves. When ready, bring your dials (still hidden) on the map window, besides your ships and declare you're ready in the chat window. Most players use the word "set". 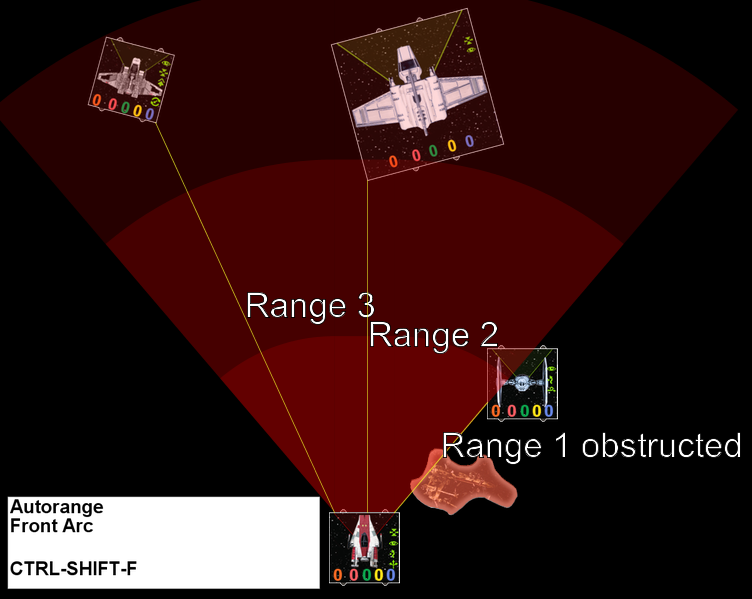 (activation phase) Respecting play order with regard to ascending pilot skill activation, reveal a dial with the same shortcut, Ctrl-R and activate your ship (see next item). Some players enjoy rotating the dials, as it gives you an easier time to visualize the proper direction for turning ships when they're facing downward, for example. Do this by clicking on the dial and hitting the left or right arrow keys. Way #1: through the right click menu. 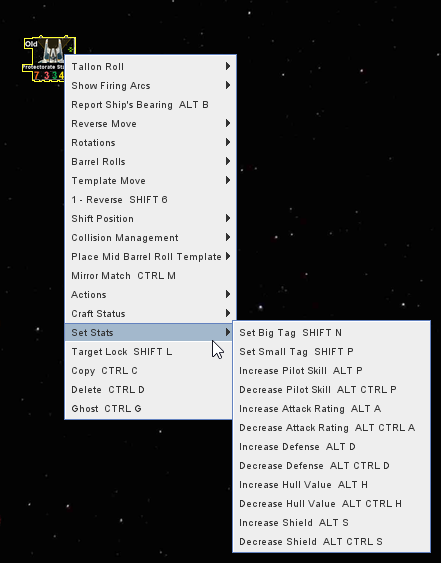 Right click on a ship, find your move in the template move submenu. How do you manage to remember all this? You can always check up on shortcuts under the button "How To & Shortcuts", under "Movement Shortcuts". This image can be dragged and dropped around on the map or into your player window. Way #1: more tedious, but more intuitive. 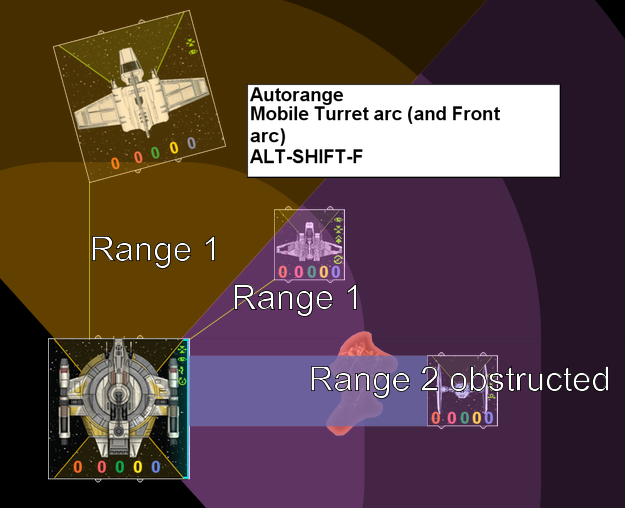 If you used the automatic squad spawn feature inside your player window, you should normally have all the tokens associated with the actions that your ships are capable of. If, for some reason, some are lost or missing, you can always spawn some more from the Pieces window, Chits/Tokens tab. This is tedious because you'll have to manually put tokens during the activation phase, then take out every unused focus and evade tokens during the end phase. There is a faster way. Shift-A to cycle through the first line of potential ship actions. Shift-Z to remove it without have to cycle it out. Alt-Ctrl-Shift-Z to remove all actions (up to 3) at once. 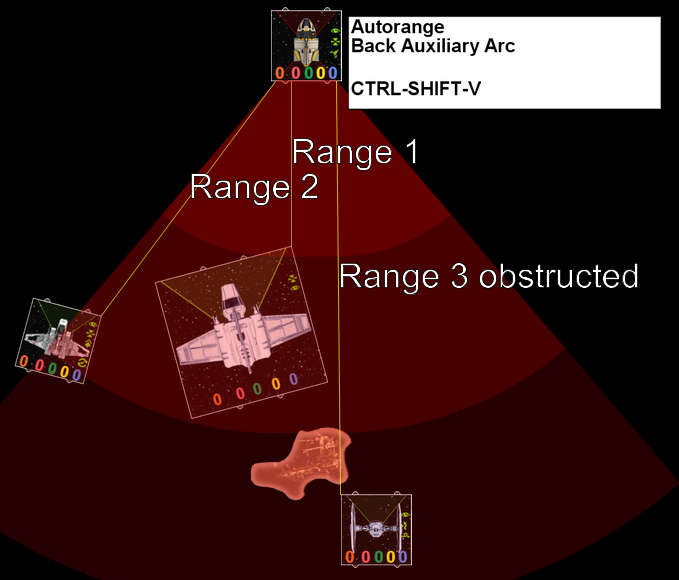 As an example, Darth Vader (in a TIE Advanced x1) with push the limit can easily go up to 3 actions during a turn and would use all three 'lines'. Click on a ship and hit Shift-S to increase the stress by 1 with a small icon at the side of your ship and it can go up to 4. To decrease the stress count, hit Ctrl-Shift-S. To remove all stress at once, hit Ctrl-Shift-Alt-S. For other ship status condition tokens, check the right click menu, or go find the shortcuts in the "How To & Shortcuts" button, under the "Ship Stats and Status" section, "Small & Large Ships" item. Alternatively, if you used the Squad Spawn feature (heatily recommended), you will receive at least 1 stress token per ship. You can drag and drop those around. You can increase its value with Shift-S and decrease it with Ctrl-Shift-S. If, for some reason, you lost all your stress tokens, you can go to the Pieces Window, under the Chits/Tokens tabs and spawn some more. 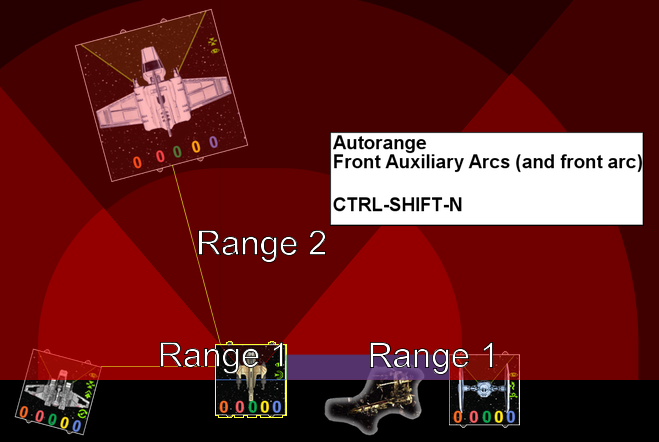 Click on your ship and hit Ctrl-L to toggle the range 1-3 finder area. It will check for range 1-3 around your ship. Zooming might be necessary for close cases. Have the dice window open at all times. Results get broadcasted in the chat window, but it's always faster to interpret results by having the graphics show it up. 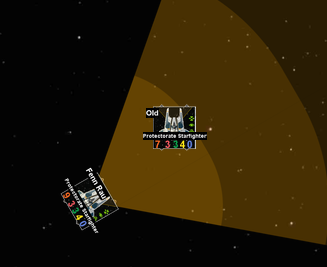 When you take damage to the hull (past shields), the game expects you to draw damage cards. Each player can spawn their own damage deck to their player window, then drag and drop cards from it, to their respective player hands as damage accumulates on the ship. This is on top of modifying the ship values on the ship pieces on the map. As for critical damage, it is customary to draw the appropriate card on the map, flip it (Ctrl-F) there and wait for some acknowledgement from your opponent. 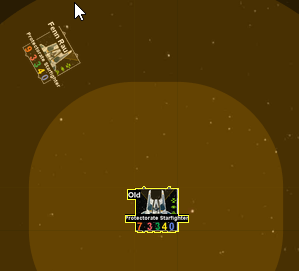 On the map, every player can then mouse-hover the card and see a zoomed version of it, allowing to read it easily. If you spawn and flip the card in your player hand window instead, only you can benefit from the mouse-hover zoom. How do I easily find what critical damage cards do? 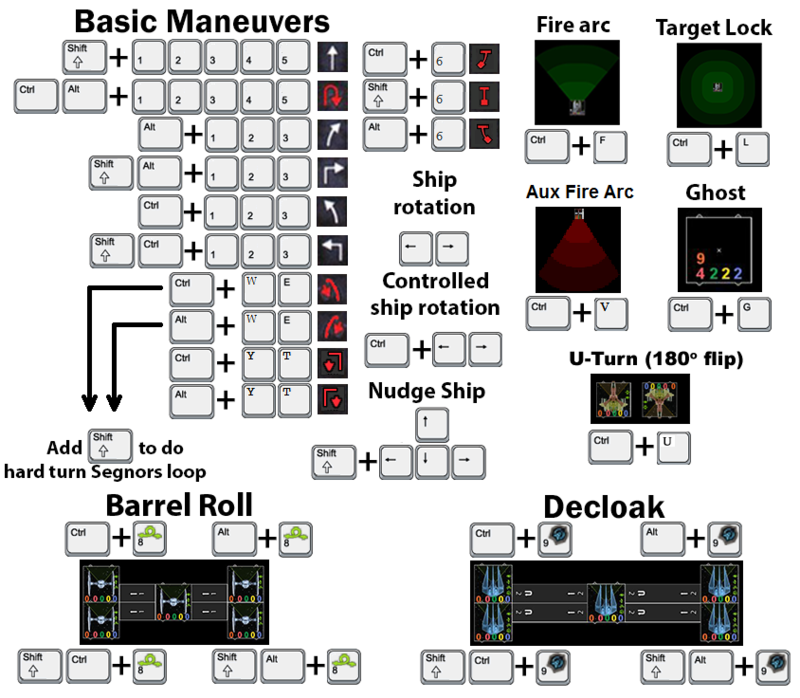 If you used the ship side action icons (Shift-A, Ctrl-A, etc. ): Click on "Reset Actions" at the top of the map window. This will clear all actions on all ships. If you instead moved standalone tokens (ie provided from the automatic squad spawn), you will have to manually remove them from the play area. This is why using the action bars is so much more quicker than spawning and dragging around multiple token chits manually. How do I easily check the range of a shot? How do you create and use log file that saves every step of a game? In order to save a log of a game, you must start the recording of the log before the game starts. This is done with the File Menu/Begin logfile. When you're ready to end it, go to File Menu/End Logfile. In order to load a log of a game, first, make sure you're in a game room. Next, without needing to create a new game in that room, you can directly open your log with File Menu/Load Continuation and pick your log file (.vsave file format). In order to step through the log, you must click on the right oriented arrow button in the chat window toolbar. Once you've clicked at least once on that button, you can optionally step through using the Page Down key. To step rapidly through the log during slow moments, you can hold down the Page Down key. How do I use the Lancer-Class Pursuit Craft Mobile turret? This image explains the shortcuts explicitly. 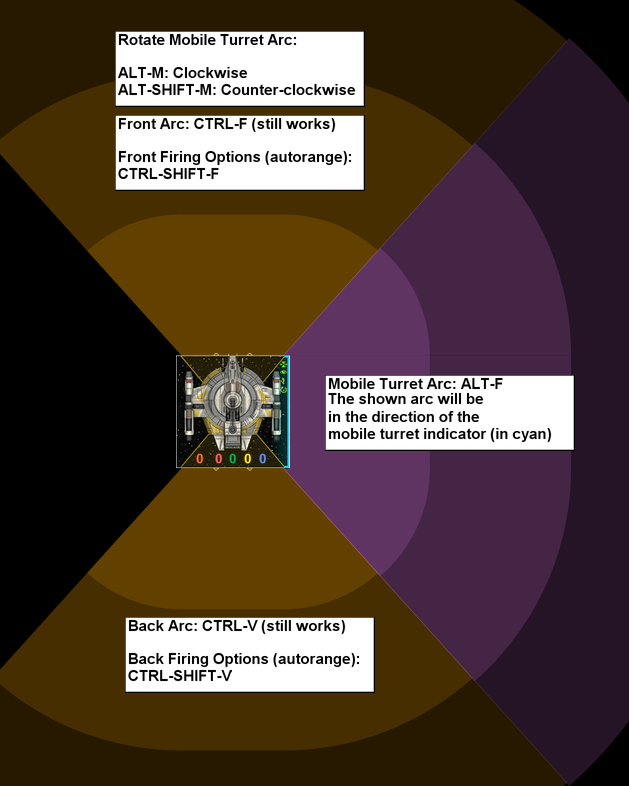 Toggle your firing arc with CTRL-F, in the direction of the cyan mobile turret indicator. Works for all 4 directions. The rotation of the cyan overlay can be done clockwise or counterclockwise. 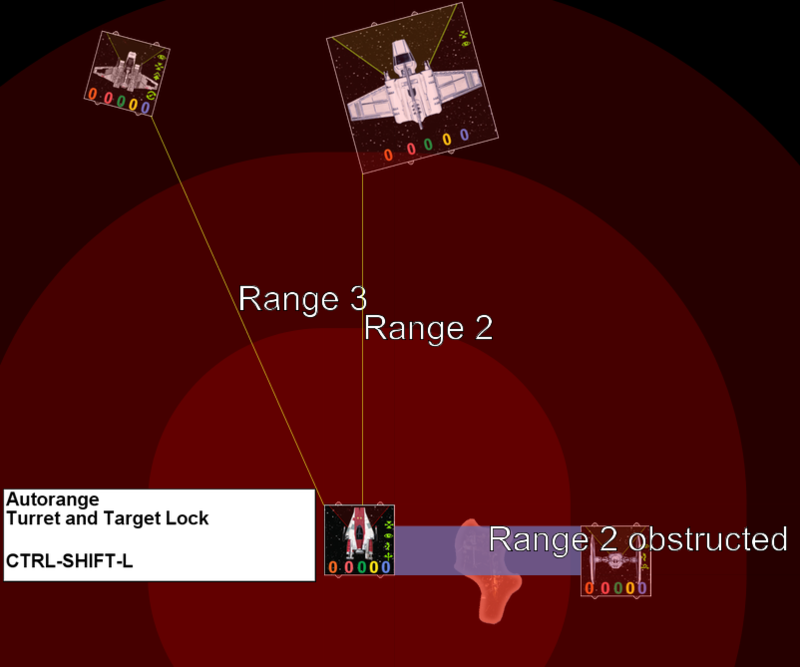 The first step is to drop a bomb spawner with CTRL-B (CTRL-SHIFT-B is you want to drop in front of your ship instead). Then, you manipulate the spawner to drop a bomb. How do use my M12-L Kimogila Fighter bullseye arc? To toggle the Bullseye arc, hit CTRL-X. You may want to use it in conjonction with the bullseye autorange feature, activated with CTRL-SHIFT-X.